SI RICORDA CHE GERGAS SPA È ESCLUSIVAMENTE IL DISTRIBUTORE DI GAS METANO, PER LE RETI DI GROSSETO E CAMPAGNATICO, PER CONTO DELLE SOCIETÀ DI VENDITA CHE SU TALI RETI EFFETTUANO LA FORNITURA DI GAS AI CLIENTI FINALI. PERTANTO, TALI RECAPITI - AI SENSI DELLA NORMATIVA A.E.E.G. 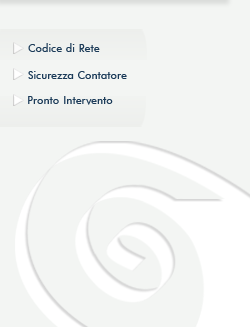 VIGENTE - NON POSSONO ESSERE UTILIZZATI DAI CLIENTI FINALI AL FINE DI FORNIRE AUTOLETTURE DEL CONTATORE. QUALORA IL CLIENTE FINALE DESIDERI FORNIRE L'AUTOLETTURA A FRONTE DI UNA CARTOLINA RILASCIATA, PER ASSENZA DURANTE IL GIRO PERIODICO DI LETTURA, DOVRÀ CONTATTARE IL PROPRIO VENDITORE DI GAS METANO AI RECAPITI DALLO STESSO FORNITI.